Hello Kitty Town Malaysia which opened in Oct 2012 has become one of the major tourist attractions in Johor, Malaysia. 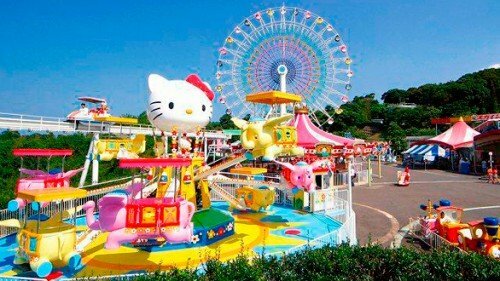 It consists of walk-through attractions, play structures, various interactive activities and a ride which follows the Hello Kitty theme. Key features include, Black Wonder - a hi-tech interactive themed experience, Kitty House - an iconic Hello Kitty house with a living room, bedroom, bathroom and kitchen. This 60,000 square foot indoor facility is one of the 5 flagship zones in Iskandar Malaysia and comprises of The Little Big Club that is designed around HIT Entertainment's popular characters like Thomas & Friends™, Bob the Builder™, Angelina Ballerina™; Barney & Friends™ and Pingu™. A unique themed family restaurant by a popular local Malaysian cartoonist, Lat is another great attraction where you can savor local Malaysian delights. Kitty House – an iconic Hello Kitty house complete with living room, bedroom, bathroom and kitchen. The “Purrfect” stage - an area where Hello Kitty, My Melody, Little Twin Stars among others will be featured. There are many interesting activities for kids and parents to participate in which include jewelery-making, throwing a costume party, nail painting or even cookie baking at Wishful Studio. For those wanting to celebrate birthdays or special occasions, there are options available at the Apple and Strawberry party rooms as well. From Kuala Lumpur: Take the North South Plus highway, take exit 253 to Senai Airport/Tuas and proceed to Exit 311 showing way to Kota Iskandar. Continue towards Kota Iskandar and proceed to Puteri Harbour. From Singapore: Use the second link at Tuas, proceed towards Kota Iskandar. Take exit 312 which will take you to Kota Iskandar. Thence, look for direction to Puteri Harbour. From Johor Bahru (JB): Take the new Coastal Highway to Kota Iskandar after passing Danga Bay. Follow the sign towards Puteri Harbour.Hello Kitty Theme Park is located next to Puteri Harbour and Trader's Hotel. So re-visit your childhood to experience fun, only in Malaysia. Hello Kitty Malaysia has all it takes to keep the kids occupied the whole day with activities such as nail painting, stage shows, costume photo taking and many others.